"Clan of the Fiery Cross Episode 1"
When Jerry Siegel and Joe Shuster's creation first graced the pages of Action Comics in 1938, it may not have been obvious that "the Man of Steel" was more than a guy in a cape who could fly in his underwear. Superman became a symbol of the fight for Truth, Justice, and the American Way. Although the famous catchphrase caught on during the Second World War, it embodied more than just the fight against Fascism. After all, even Donald Duck took a few shots at Hitler and the Japs, but Superman's fight for Truth, Justice and the American Way was at its base a moral one. Old Time Radio and comic book fans are well aware that many of the traditional characteristics of the Man of Steel were developed on radio's The Adventures of Superman and later adopted in the comic pages and film. Although Superman was a fantastical and fictional hero, it is a fact that the visitor from Planet Krypton played an important part in bringing down the hate group called the Ku Klux Klan. The original Klan was created during the Reconstruction of the South following the Civil War by a small group of Confederate veterans (the group's name is derived from the Greek word kyklos, or circle, with the word clan for group). There were a number of secret organizations springing up in the Reconstruction South which used terror to shape public opinion against blacks and Republican politicians, but few captured the public imagination like the KKK. The Klan was considered a guerilla military force serving the interests of the Democratic party and the planter class, but their cowardly vigilante tactics backfired and founder Nathan Bedford Forrest eventually called for the group to disband. After D.W. Griffith's Birth of a Nation (1915) was released a new Klan and more powerful Klan emerged. The reformed KKK included anti-Semitism and anti-Catholicism in its agenda and became more urban, expanding its influence into the Northern Industrial Belt and West to California. The new Klan was preparing an ambitious expansion in the aftermath of WWII. After seeing the Klan's rise in Florida, author and folklorist Stetson Kennedy infiltrated the organization and learned their ceremonies and secret code words. He tried to pass the information on to law enforcement organizations but found that the police were uninterested or already in league with the new Klan. Instead, Kennedy took his information to the writing team of the Mutual Network's The Adventures of Superman. The Man of Steel first appeared in the pages of Action comics in 1938, and two years later came to the airwaves of the Mutual Network. During the War, many of the serial's story arcs were focused on Superman helping to defeat the Axis forces. When Victory was finally achieved, the Man of Steel found himself with a shortage of bad guys. This made Stetson Kennedy's revelations especially welcomed. In at least four story arcs on Mutual's The Adventures of Superman from 1946 through 1948, loosely grouped together as "the Unity House" stories, the Man of Steel goes against organizations which embody the sense of intolerance and hatred which not only brought the Fascists to power but which threatened to tear apart the very fabric of American values. Although he was a very American symbol, Superman was the ultimate outsider. Not only was he not born in America, he wasn't even born on this planet! 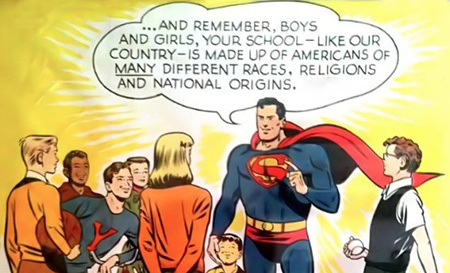 This gives both Superman and his alter-ego Clark Kent a clearer understanding of the fact that everyone in America is different, that we are a mixed people who have come together from several different backgrounds, none of which is any better or worse than anyone else's. "The Unity House Stories" could have appeared on any radio drama which featured good-guys and bad-guys, from Red Ryder to Gunsmoke to Dragnet, but they would not have had the effectiveness and import that they found on Superman . Matt Dillon would have sounded natural defending someone even though their skin was a different color, and it would be a small stretch for Joe Friday to equate a white supremacist with the recently defeated Nazis, but they would not have been as effective at reaching kids, or even adults. 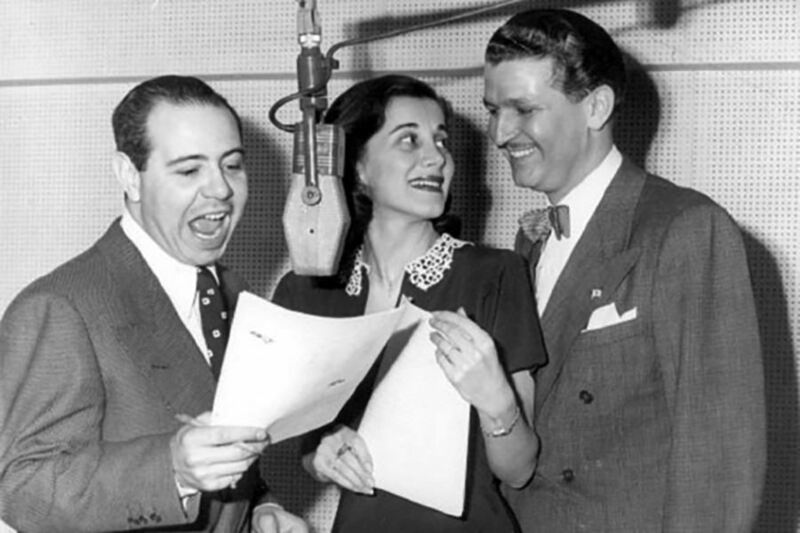 The first of the Unity House stories begins when a pair of thugs torch a drugstore in the middle of the night in the episode originally airing on April 16, 1946. The thugs belong to "The Hatemongers Organization" and the owner of the drug store is part of a committee which is intent on opening Unity House, a neighborhood clubhouse which will give kids something constructive to do after school (also on the committee are a priest, a minister, and a rabbi). Naturally, Clark Kent's young friend Jimmy Olsen becomes deeply involved in Unity House and winds up involved in many of the cliffhangers through all four of the story arcs. The Hatemongers are led by a mysterious figure who intends to lead a gang of youths on a crime spree, and Unity House will only get in his way. By the end of the arc, Jimmy and Superman discover that not only is the leader of the Hatemongers a crook, he was also a draft dodger AND low-level Nazi operative, much to the dismay of the kids he tried to influence, most of whom had fathers, brothers, and uncles who made sacrifices in the fight against the Fascists. After putting an end to the Hate Monger Organization, the Man of Steel entered another story arc, this time helping Lois Lane to battle political corruption. In the meantime, Jimmy Olsen has become manager of the Unity House baseball team, and the club is doing very well in the Metropolis City league. At practice in the June 10, 1946, episode, Jimmy is faced two of his players fighting over the number one pitching spot. The cub reporter gives the spot to the better player, Tommy Lee, and the kid who was not chosen, Chuck Riggs, jealously crowds the plate at batting practice and gets beaned. That evening, Riggs tells his uncle about the incident, and the uncle convinces Chuck to claim that Tommy hit him on purpose and was, in fact, trying to kill him because the Lee family were not "true Americans" (the writers chose to wait for several episodes before revealing that the Lee family is of Chinese descent). We soon discover that Chuck's uncle is the Grand Scorpion of the Metropolis chapter of the Clan of the Fiery Cross. The Superman writers created a thinly disguised version of the Ku Klux Klan for "The Clan of the Fiery Cross". A newly revived Klan had emerged in the aftermath of WWII and was making plans to expand recruitment into the Industrial Belt and the West. Folklorist Stetson Kennedy had infiltrated the Florida branch of the revised Klan to learn their secrets and became understandably frightened by what he had learned. Even more frightening, when Kennedy presented his discoveries to local authorities, the police were either frightened to move against the Klan or were already under Klan control. 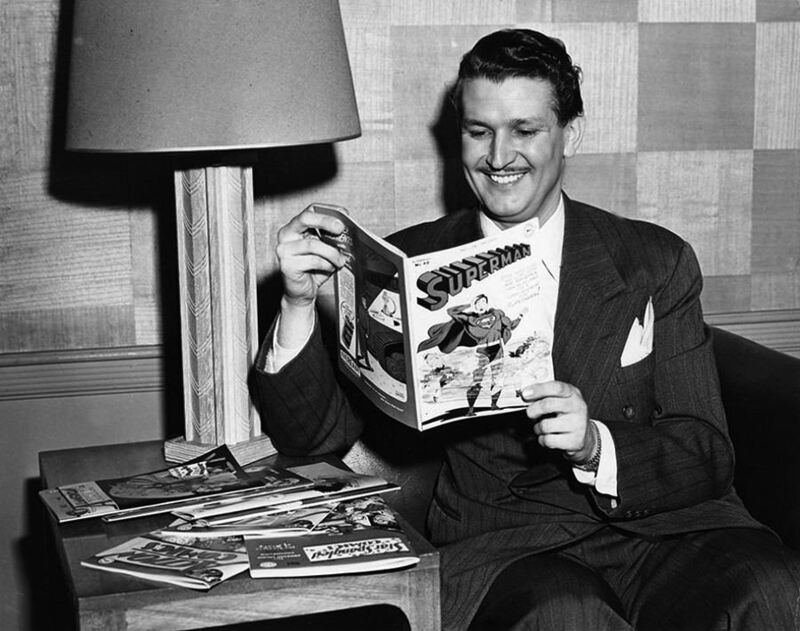 However, Kennedy was able to share his information with the Superman writers. "The Clan of the Fiery Cross" story arc was developed and broadcast in June of 1946. The story begins with Jimmy Olsen managing the Unity House baseball club and excited over their prospects with new pitcher Tommy Lee whose family recently moved to the neighborhood. Naturally, this upsets the team's former pitcher, Chuck Riggs, who crowds the plate during batting practice and accidentally gets beaned. Riggs' uncle Matt, the Grand Scorpion of the Clan of the Fiery Cross, decides that Tommy Lee and his family are not "real Americans" (it is not revealed until the third episode that Lee's family are Chinese and his father was appointed to the city medical department over one of Riggs' friends). Through most of the sixteen episodes of the "Fiery Cross" story arc, the Clan and its Grand Scorpion manage to stay one step ahead of the Man of Steel until they try to execute Jimmy Olsen and Daily Planet editor Perry White. Superman steps in with seconds to spare, but the Grand Scorpion escapes to confer with the Clan's national leader, the Grand Imperial Mogul. The Mogul berates the Grand Scorpion for actually believing the Clan's racist propaganda, stating that it was simply a device to get new members and that the Clan's hierarchy was taking a cut on the sale of robes. 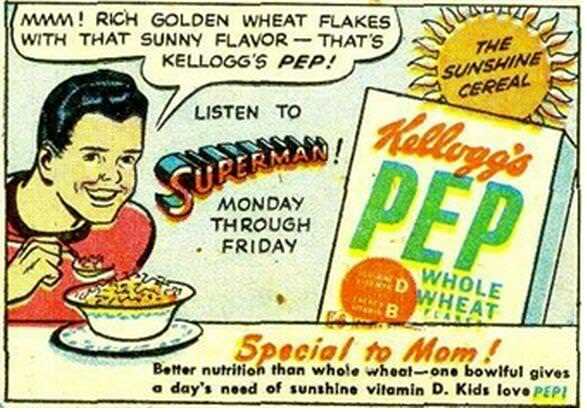 The real KKK found nothing amusing about the story arc and tried to start a boycott against the sponsor, Kellogg's PEP Cereal. 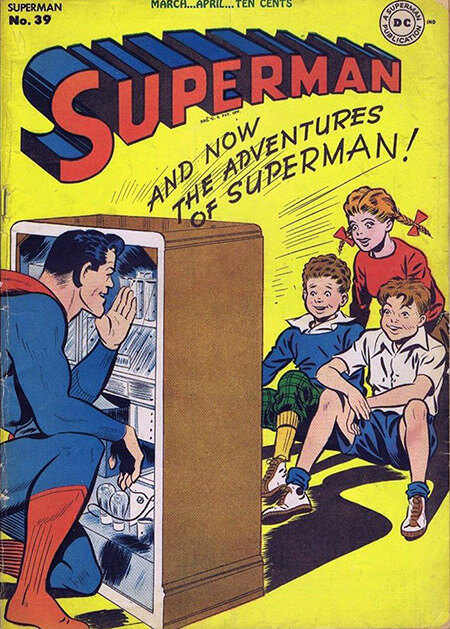 By this point, the Klan had been made to look foolish, the boycott went nowhere, and Mutual reported an increase in Superman's ratings. Interestingly, the Fiery Cross story arc kept the actual Ku Klux Klan thinly disguised, but the real damage to the Klan came in the fourteenth episode when Matt Riggs visits the national leader, The Grand Imperial Mogul of the Fiery Cross. The Mogul cannot believe that Riggs believes the hatred hokum the group uses to attract “the suckers”. Had the Klan simply ignored Superman's accusations, the revelations of their ceremonies and codes probably would have dismissed or forgotten. Instead, the Klan began calling for a boycott against the program's sponsor, Kellogg's PEP Cereal. To Kellogg's credit, the folks in Battle Creek stood by the Man of Steel. The Klan's reputation and power depended upon their mystique. With their ceremonies and secrets revealed and made to look ridiculous, the Klan's mystique and power evaporated. Recruitment dried up in the months after "The Clan of the Fiery Cross". 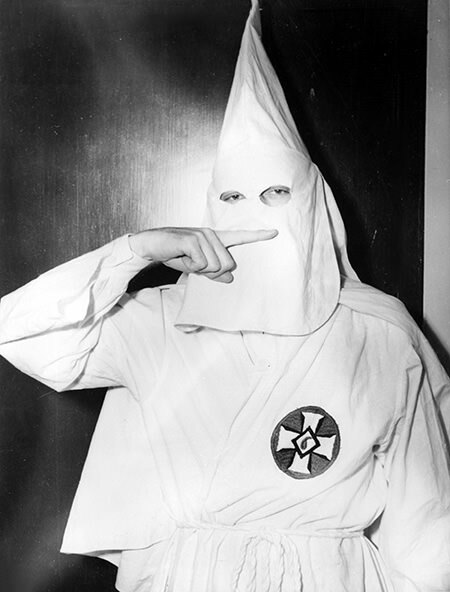 The Klan resurfaced briefly in the late 50's and early 60's, but they were recognized as being little more than a white supremacist terrorist group with little or no political power. The most important lesson of The Clan of the Fiery Cross is that the power of hate groups evaporates when the light is shone on them and their tactics. Beginning on February 26, 1947, Clark Kent and Jimmy Olsen find themselves facing another racist organization thinly disguised from a real-life group. Both the KKK and the Knights of the White Camelia originally grew from the resentment of Southerners during the aftermath of the Civil War. While the original Klan drew its members from veterans of the Confederacy and poor whites, the Knights came from the upper-classes of what had been antebellum society, landowners, physicians, newspaper editors, and the officer class. "The Knights of the White Carnation" story arc begins in the drawing room of an aristocratic home in Metropolis where members of a secret society are meeting. They discuss the Metropolis High School Varsity basketball team who is about to enter the State Championship. The group has discovered that four of the team's five starters are "Un-American foreigners" which they intend to cleanse from the country. One member of the White Carnation group is offended by the racist talk and intends to share the story with Daily Planet editor Perry White. However, White's friend is killed in a mugging before he can share the information. The remaining members of the White Carnation arrange for four of the basketball players to be suspended for gambling, an accusation that Clark Kent believes to be false. However, his investigation is hampered by interference from the cream of Metropolis society. The Man of Steel eventually brings down the Knights of the White Carnation, but the arc suffers from a largely recycled story and a good deal of over acting. The Unity House stories wrap up with a story arc "The Skin Game". In this arc, the victims of prejudice are African-Americans, referred to as "Colored", the accepted and politically correct term in the late Forties. Jimmy Olsen is acting as assistant coach of the Unity House track and field team and has been distracted recently. Two of his star runners have been threatened because a member of another squad does not want to compete against Colored runners. Jimmy gets shot, apparently by live ammunition which gets mixed with the blanks for the starter's pistol, but it is actually an assassination attempt of the runners. When the bullets begin flying in earnest, the Man of Steel is there to step in and foil another racist plot. As someone who is from an alien world, Superman may have been the perfect figure to present a lesson in racial tolerance. To the credit of Superman's writers and producers, the lessons are presented in an entertaining, even subtle manner. Just the sort of thing we should expect when we "Look, up in the sky…"
This collection is is part of the more extensive Adventures of Superman collection. See also Civil Rights, Racism, Discrimination, and Prejudice in Old Time Radio, KKK in Old Time Radio, Superman Fights the KKK, People Take the Lead, Destination Freedom, Racist Music, Former Slave Interviews, A New World A-Coming, and Minstrel Shows. Be the first to comment on "Superman Fights the KKK"